Ponden Mill01535 643923work Guest AccommodationPonden Mill was built in 1792 to Spin Cotton and was situated in such a beautiful valley to take advantage of the power offered by the water coming off the moors. The Bronte children played often in this valley and the church at the end of our car park is actually Gimerton chapel from Wuthering Heights. We are on both the Pennine Way and the Bronte Way, Haworth is close by, as is a good pub. We have restored two bedrooms in the Mill to a very high standard, both with en-suite.facilities. We do have a café in the mill and can offer meals and packed lunches for people doing walks. We can also arrange to pick up bags if you are coming on foot, or via the Keighley and Worth Valley Steam Train. We are family friendly and it’s a quick walk to the fairy cave at Ponden Kirk. 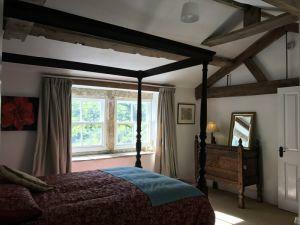 The Mill is haunted but nothing has appeared in the guest room part of the mill……. yet. An 18th Century Riverside Cotton Mill with 2 Luxury B&B rooms overlooking open countryside. We are on both the Pennine Way and the Bronte Way, Haworth is close by, as is a good pub.